NOTE: The prices listed are indicative only and we often have discounts available so please get in touch for a quote by clicking 'Enquire Now'. A bright, centrally located one-bedroom apartment (sleeps 1–4) on the second floor of an architecturally significant building (B-listed) on Forrest Hill, a quiet lane off George IV Bridge, close to the historic Royal Mile and within easy walking distance of the major tourist attractions, festival venues, shops, night-life and transport connections. It is also conveniently situated for the University of Edinburgh. About this property: The homely living room has a peaceful outlook over Greyfriars Church. There is a fireplace and a comfortable dining area. The two-seater sofa converts in to a double sofa bed and there is a comfortable armchair. An attractive rug sets off the polished wooden floors, and a TV (with DVD and CD player) and a selection of books and DVDs complete the home comforts. The modern kitchen is well provided with crockery, cutlery, glasses and kitchenware, as well as a washing machine, fridge-freezer, cooker and microwave. The double bedroom, a quiet room overlooking the church, has wall-to-wall carpeting and is well furnished. The shower-room is tiled and has a wash-hand basin, toilet and standard-size power shower (no bathtub). The local area: The apartment looks over Greyfriars Church (built in 1620) and churchyard to the spires and roofs of the Old Town. There are many tales attached to Greyfriars, perhaps the most famous of which is that of Greyfriars Bobby, a faithful Skye terrier. So devoted was the dog to his master John Gray that when Gray died and was buried in Greyfriars Churchyard, Bobby kept guard over the grave for fourteen years until his own death in 1872. The dog is buried close to his master and his faithfulness is commemorated in a statue opposite the entrance to the churchyard at the junction of George IV Bridge and Candlemaker Row. In the 18th and 19th centuries, the churchyard was a haunt of the ‘Resurrection Men’: body-snatchers who would dig up fresh corpses to sell for dissection to anatomists at the nearby medical school. You can find out more about Edinburgh’s grisly past on the guided tours that leave from the Royal Mile (see, for example, Mercat Tours, Witchery Tours and Mary King’s Close). Nearby attractions and sights: Across the road from Greyfriars Bobby are the National Museum of Scotland, an award-winning modern building that holds the national collections, and the adjoining Royal Scottish Museum. The Tower Restaurant on the top floor of the Museum of Scotland has terraces with spectacular views over the city. The apartment is close to the main campus of the University of Edinburgh (established in 1582) and its landmark buildings Old College (the Faculty of Law), the Medical School and the McEwan Hall. Beyond the University lie the Meadows, a large area of open parkland. From the apartment it is a short walk along George IV Bridge to the Royal Mile and Edinburgh Castle or down Candlemaker Row to the picturesque Grassmarket and the more earthy Cowgate, centre of the city’s nightlife. The Royal Mile, the backbone of medieval Edinburgh, connects Edinburgh Castle at one end with the Palace of Holyroodhouse and the Parliament at the other. The shower-room is tiled and has a wash-hand basin, toilet and standard-size power shower (no bathtub). A baby travel cot and high chair are available upon request. A relaxing retreat in the heart of a charming city. We enjoyed our stay in Edinburgh very much, due in large part to the comfort of this flat. The property was very clean and cozy. We felt at home in the center of the city and were within walking distance to a variety of attractions and restaurants. It’s safe to say that we became regulars at a few of the local establishments. Martin provided detailed information prior to our arrival and also had a “how to” booklet containing important information regarding the ins and outs of the property. He was also available via phone/text if we needed additional guidance. We’d grown very attached to the property, that on our final day in Edinburgh we had difficultly leaving! We look forward to returning to Scotland and to this flat. 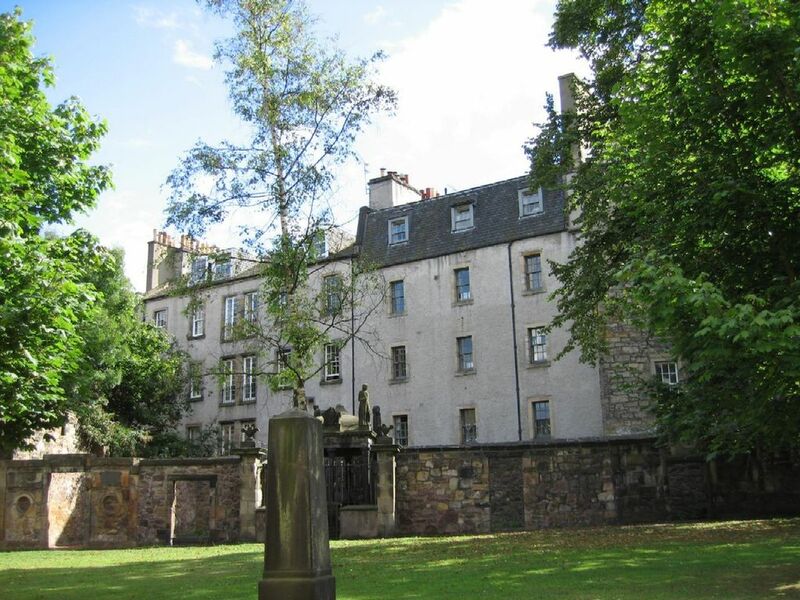 Cozy and charming apartment next to historic Greyfriars Cemetary, very quiet. My husband and I stayed at GreyFriars Apartment for a week in March. It was cozy and a pleasant place to spend time in. The kitchen is well outfitted for making a simple meal, and we usually made coffee and breakfast in. The sofa is nice for lounging and I really appreciate the nice lighting throughout the apartment. Its so much nicer ambience to have table lamps and reading lamps rather a bright overhead. Our check in was simple with a self check in key code to retrieve the keys. We had a good stay. If I had to mention a negative, I would say th mattress in the bedroom could be replaced. It is a bit saggy. Petit appart hyper pratique et bien situé dans la vieille ville. De quoi faire du café et cuisinner; petit problème avec le chauffage résolu dès que je l'ai signalé. C'était Super! Really enjoyed our stay. Ideal as a base while visiting my daughter at Uni. Problem with heating sorted very quickly so very toasty at night. Bed was very comfortable and shower worked well. One thing that would be great would be large bath towels or bath sheets as I found the towels provided a little small though adequate. Perfect location - very quiet but close to the centre. Imacculately clean. Very comfortable for one or two people. Thanks for the tea, coffee and biscuits on arrival. Everyhting you could ask for. This flat was everything we could have hoped for! It's nice and centrally located. The Royal Mile and all of the tourist sights are close by, with plenty of places to grocery shop, have a meal, or grab a pint very close. Sandy Bell's Pub was a real treat! Martin was great! Everything we needed to get settled was ready well before we got there, the bottle of wine was very thoughtful! On a personal note, it turns out that, 180 years ago, one of my ancestors ran a pub about 3 blocks from the flat! Sadly, while the building is still there, it's now take away shops, not a pub. We're not sure when we'll be back in Edenburgh, but we'll definitely look to see if this flat is available then. I'd recommend it to anyone looking for a nice, clean, centrally located home base for their visit! A bright, centrally located one-bedroom apartment (sleeps 1–3) on the second floor of an architecturally significant building (B-listed) on Forrest Hill, a quiet lane off George IV Bridge, close to the historic Royal Mile and within easy walking distance of the major tourist attractions, festival venues, shops, night-life and transport connections.